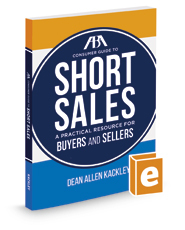 Published by the American Bar Association (ABA), the ABA Consumer Guide To Short Sales explains in plain languange how a consumer can make the most out of the federal program governing short sales, the Home Affordable Foreclosure Alternative, and how a buyer can purchase a short-sale property at less than market value. Since 2008, more than 2 million U.S. homes have been sold via short sales, providing financial relief to strapped homeowners and opportunities for savvy buyers and investors. In a short sale, the lender accepts less than the full amount owed on the mortgage and releases the homeowner from any future payments. The book translates technical guidelines into an easy-to-understand, practical resource that will help homeowners and potential buyers evaluate whether a short sale transaction is the right choice for their circumstances, and help them discuss the short sale option knowledgeably with their lenders. Since the book is published by the ABA, you can be sure that the information contained in it is unbiased and of the highest quality. In addition, the book contains a dozen forms and notices that will help consumers negotiate and understand the short sale process. The book also features a full glossary on terms for those unfamiliar with ther terms.